When Cecil Sharp visited Winster in 1908 and documented the local Morris dances the tradition was already long established. Although Winster Morris ceased to dance soon after Sharp's visit in 1908, there was a revival of interest in the 1920s and again in the 1950s. Then in 1977 Roy Witham, Dave Bathe and Ian Russell re-established the team and it has danced every year since then - the centrepiece of the dance year being Wakes Day in Winster (below) when we dance all round the village throughout the day. We welcome both men and women and dance as a mixed team, a women's team and as a traditional men's side. Cecil Sharp to the village in 1908. We ran school workshops on folksong and dance, commissioned a theatre piece about Sharp's life and invited all the traditional Morris teams he visited on his dance-collecting trips: Headington Quarry, Bampton, Eynsham, Abingdon, Ilminster and others. We invited them to come and dance with us over a summer weekend in Winster in 2008. 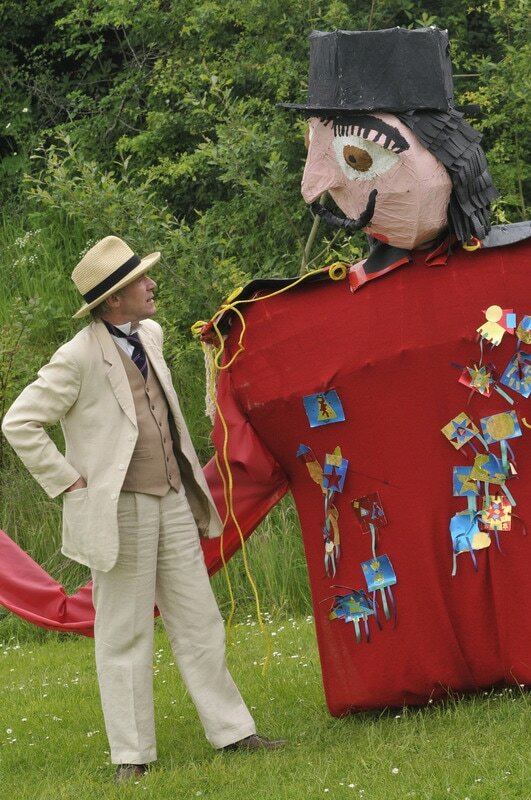 Here 'Mr Sharp' meets a marionette of our King made by the children of Winster School.